Here’s an outstanding fusion recipe, courtesy of our friends at RiverMint Dining. 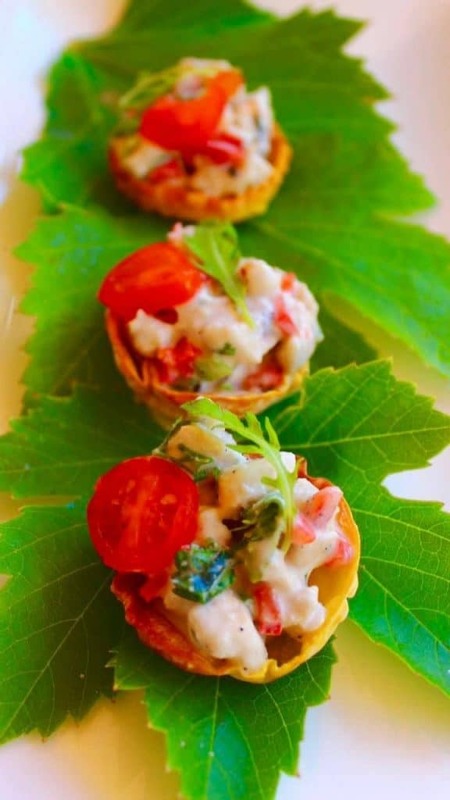 This is a simple canape recipe that doesn’t require much effort or skill, or even extra prep time for your edible natives. Just harvest these herbs and greens fresh from your garden, and away you go! Makes 20 colourful canapes, combining the hearty flavour of chicken and creamy coconut milk with the zing of Native Lemongrass, plus a handful of Warrigal Greens for added colour and texture. We’re huge fans of RiverMint Dining. They think like we do, in that they’re passionate about preserving (and popularising) Australia’s biodiversity. They use local, native ingredients in their pop-up dinners and catered events all around WA. Warrigal Greens are a common groundcover plant, native to Australia, New Zealand, Chile, Japan and Argentina. Here, they’re also referred to as Botany Bay spinach, and it’s not hard to see why. These leafy greens have been used in place of spinach since early European settlement in Australia — though most Aussies today don’t realise they’re edible! They taste similar to spinach, and can be grown and cooked like spinach too. Besides canapes, they’re great in stir fry with a little garlic or oyster sauce. They may also be used in soups, stews, or as a steamed vegetable. Native Lemongrass was traditionally used in Aboriginal medicine to treat flu symptoms, chest infections and skin sores. Like imported lemongrass, the stalks and leaves can be used in cooking, desserts and tea. Research from Griffith University (NSW) found a compound in Native Lemongrass to be as effective as aspirin in treating headaches. If you give this recipe a go, tag us on Facebook or Instagram with a picture, and share your cooking tips with our community.